With Christmas inching closer and closer, I know we’re all excited to do little Christmas decor projects but we don’t want to break the bank. 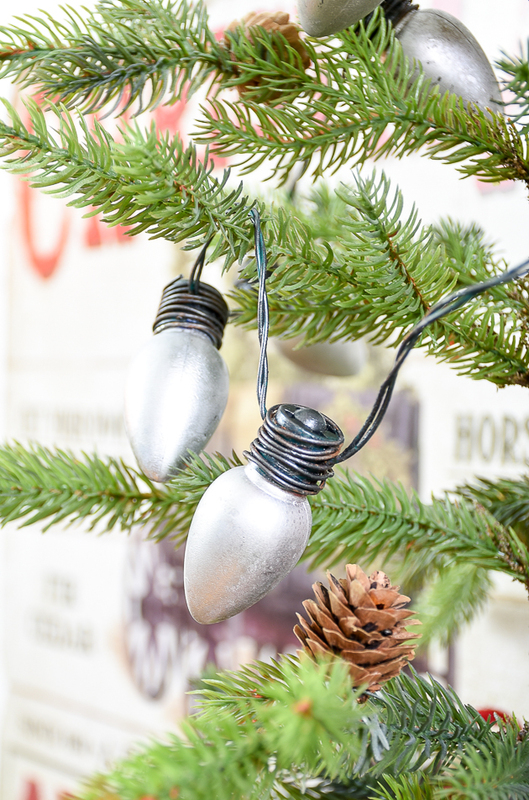 I found a few really cute and easy farmhouse style dollar store Christmas decor ideas for anyone who loves farmhouse style and saving money! All of these projects can be done with items from your local dollar store. Though you may have to get creative and substitute items if you can;t find what you’re looking for. 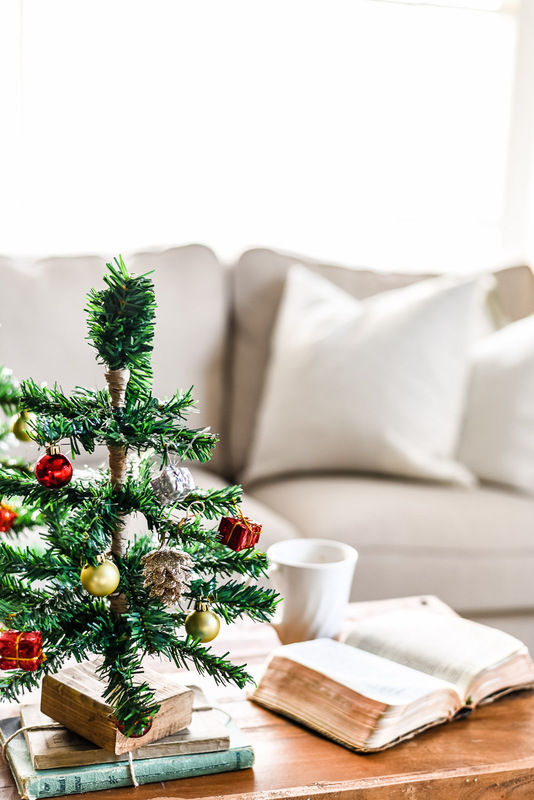 I hope this list is a great inspiration for you as you settle in and enjoy the Christmas season! Don’t forget to visit these talented creators on their own websites. I will have each project linked to the original project so you can see the full tutorial there! Tell them I sent you! Little House of Four shared a dollar store christmas decor votive, and a simple diy to customize your own adorable wooden tags. Can you imagine having a row of these gorgeous votives sitting on your shelf, lit for Christmas!? 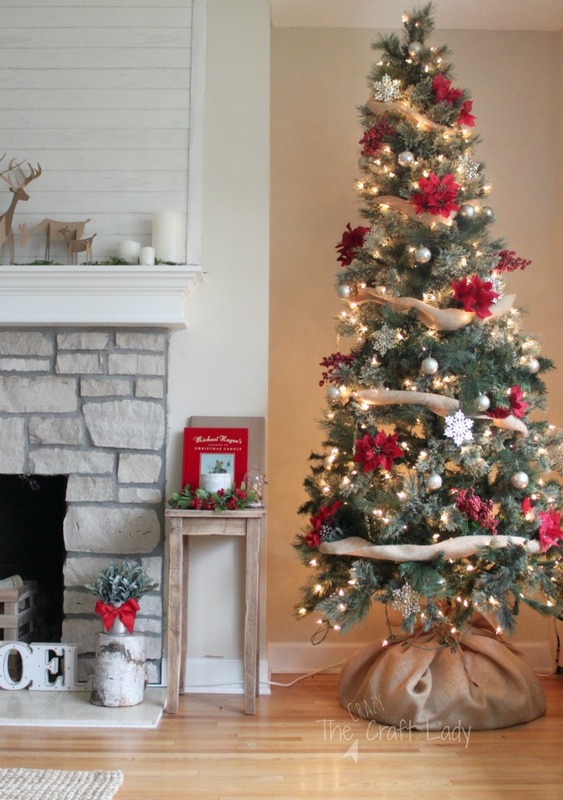 I shared how I turned a dollar store tree into a mini tabletop christmas tree inspired by Pottery Barn. I love how these little trees turned out! AKA Design made this adorable Merry Christmas garland out of simple metal rim tags she found at her local dollar store. 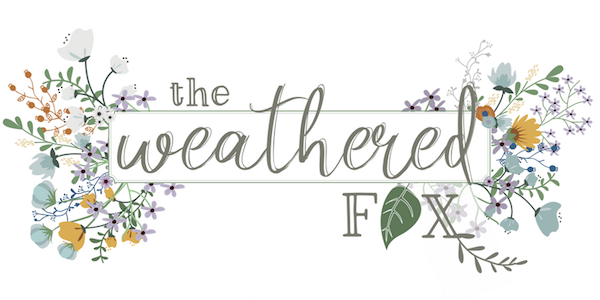 I love that this project can be customized in so many different ways. It has a simple, farmhouse charm but would look good with any style. Hunt and Host took an ordinary drinking glass and turned it into vintage farmhouse goodness. I see these types of glasses all the time at the dollar store and I never thought to use them as centerpieces the way she did. Fresh Crush had the cutest idea to create a shadowbox with dollar store items. This would even be a fun activity to do with kids. I love that little santa and the tiny snowballs at the top of the hill! There’s something about mini things that makes me fill up with joy, I’m sure I’m not the only one! Little House of Four painted cheap dollar store lights to give them vintage charm. What a smart idea! I don’t think you can actually plug these lights in, but they sure are adorable on a small tabletop tree. 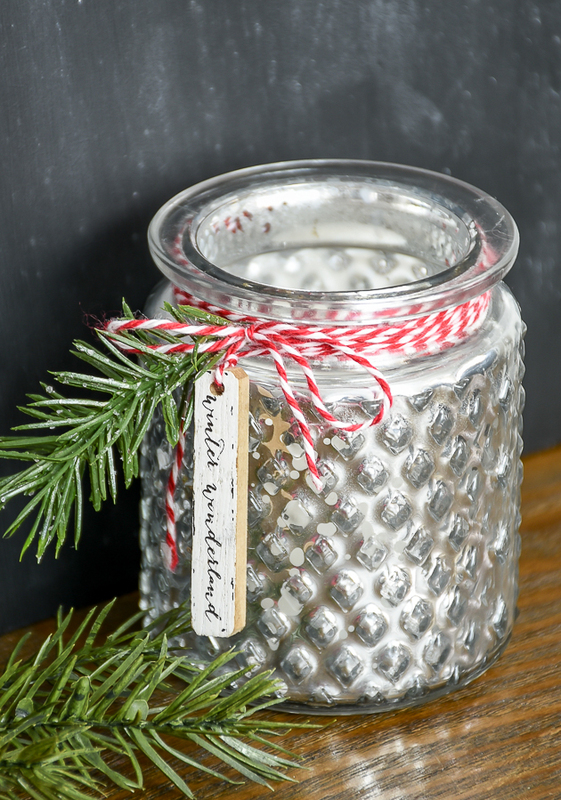 Little House of Four also shares with us how to turn a dollar store jar into a vintage ornament inspired farmhouse jar. A few of these scattered around your home would look so charming, especially if they were filled with sweets for your guests! The Crazy Craft Lady decorated her entire Christmas tree using items from the dollar store. And it only cost her $20! If you have a Dollar Tree nearby, you should be able to get the same look. 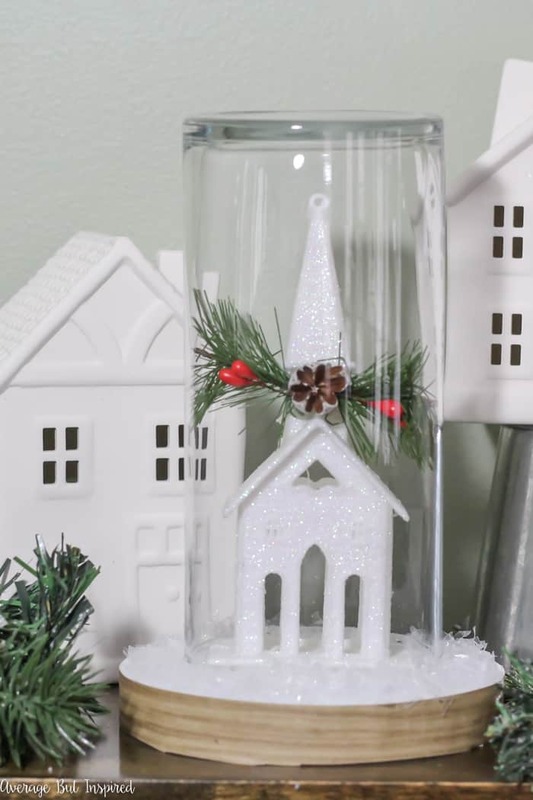 DIY Beautify created a Christmas craft that would surprise Joanna Gaines herself! 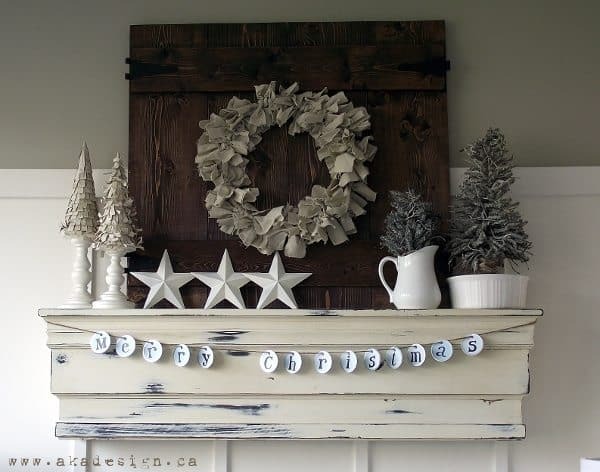 These farmhouse style shiplap ornaments are the next thing on my to do list. 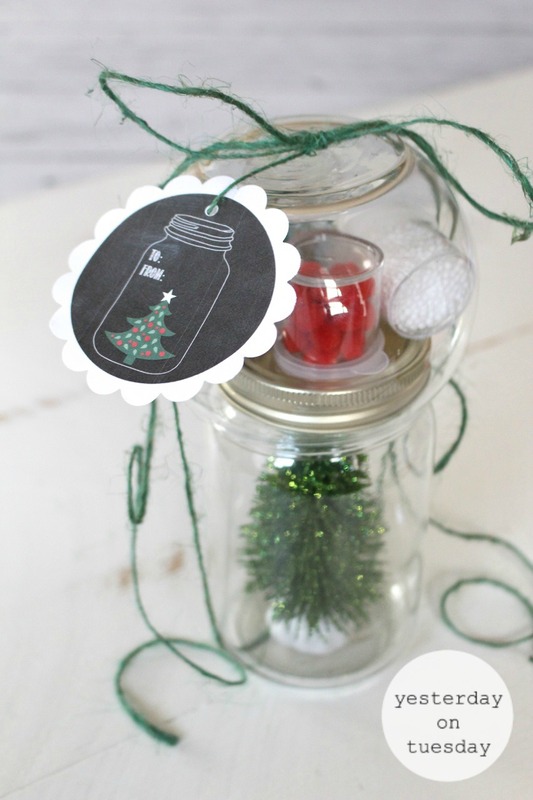 Yesterday on Tuesday shared the cutest little mason jar Christmas globe idea. Instead of making one and gifting it, why not let them put it together themselves? A bunch of these in different sized jars would look so beautiful on a tabletop or mantle. Average but Inspired shared her own version of a Christmas Cloche using dollar store items. I passed by that little tree ornament dozens of times but never thought to use it in this way. 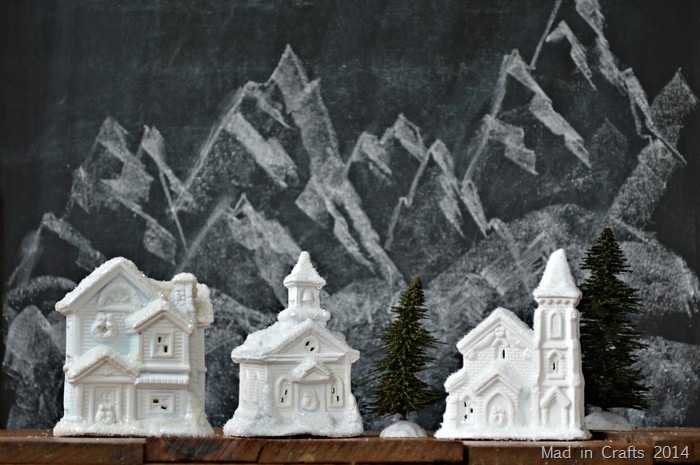 Mad in Crafts shares what a little paint and glitter can do to those little dollar store houses. The results are magical. 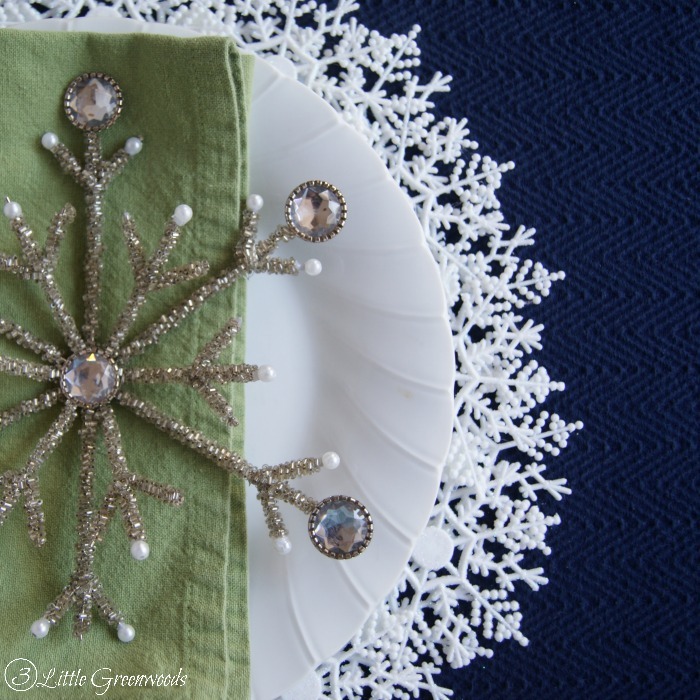 3 Little Greenwoods turned a bag of Dollar Tree snowflakes into a gorgeous plate charger for a winter themed tablescape! My jaw about dropped to the floor when I saw this! I hope you enjoyed this list of some super inspiring DIY dollar store Christmas decor ideas. Don’t forget to say hello to all the talented creators who were gracious enough to let me share these ideas with you! I always want them to know how much we appreciate them! And don’t forget, if you see an idea you like, please go to their website to pin it!